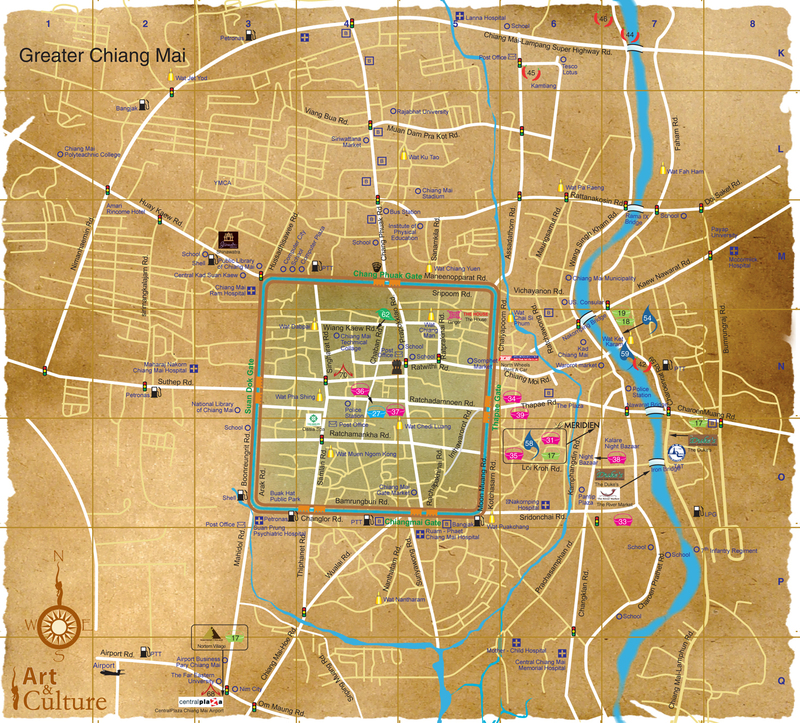 The city of Chiang Mai was born on Thursday the 8th day of waxing moon, 1296AD, at 4:00am, in the year of the monkey. 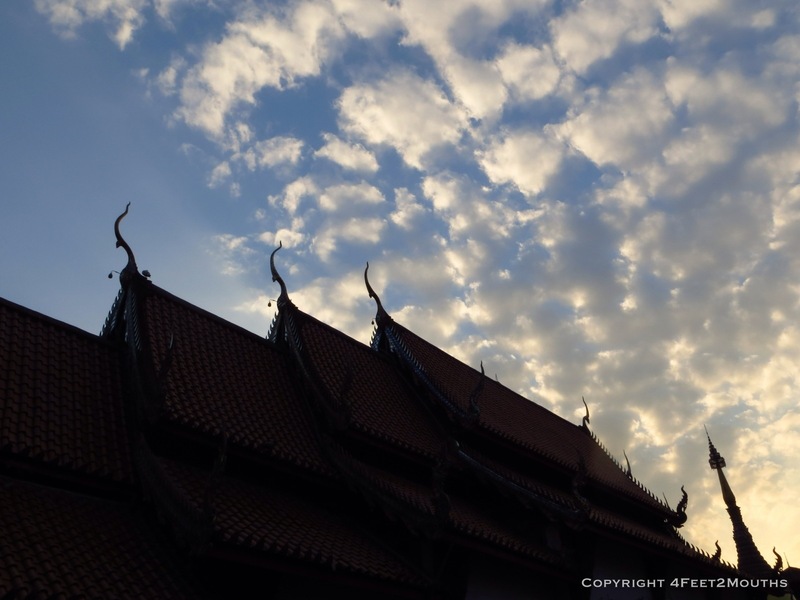 This we learned at the city’s history museum, which explained that Chiang Mai, like people, has certain personality traits as well periods of good and bad health. I liked this personification of cities and I knew Chiang Mai and I would get along just fine. First of all, I liked its shape. Not many cities have such a strong square moat, with remainders of its crumbling city wall still presiding over residents. And, of course, there was the delicious food. 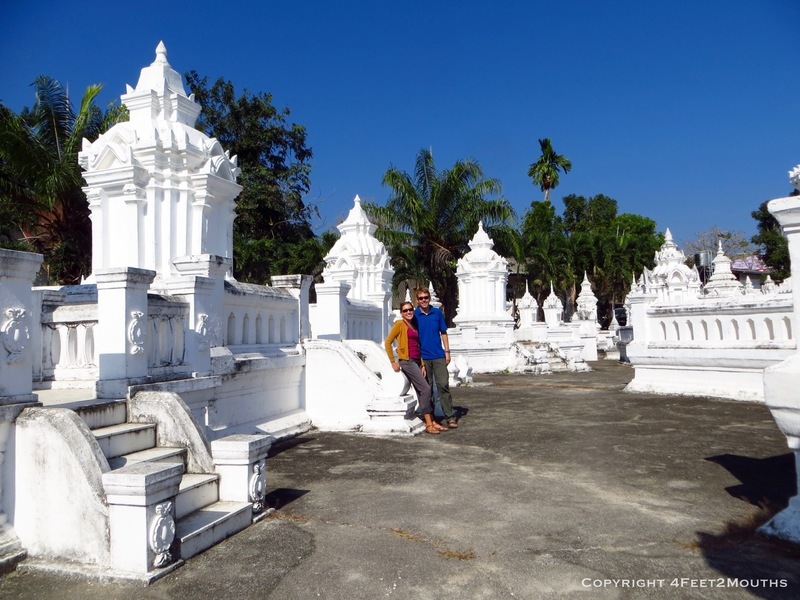 Fortunately for us, Julia and Jonathan had been in Chiang Mai just before we got there and provided some noteworthy recommendations. Two were just north of the city gate, at the Chang Puek market. 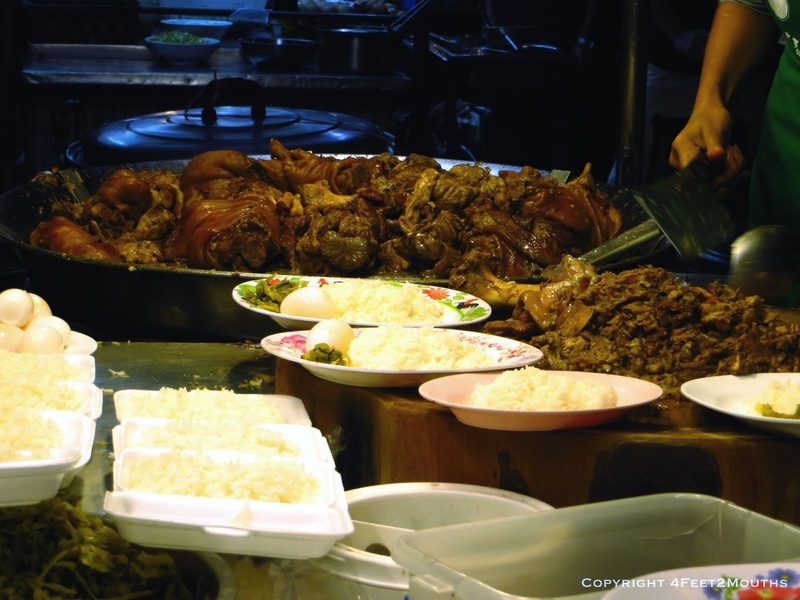 Recognizable by their cowboy hats, the pork choppers at the khao kha mu (stewed pork over rice) stall are working non-stop to fill the mountain of orders. We joined the crowds, got our plate and doused it with a sweet spicy chili sauce on the table. The slightly sweet pork mingled perfectly with the tangy sauce. 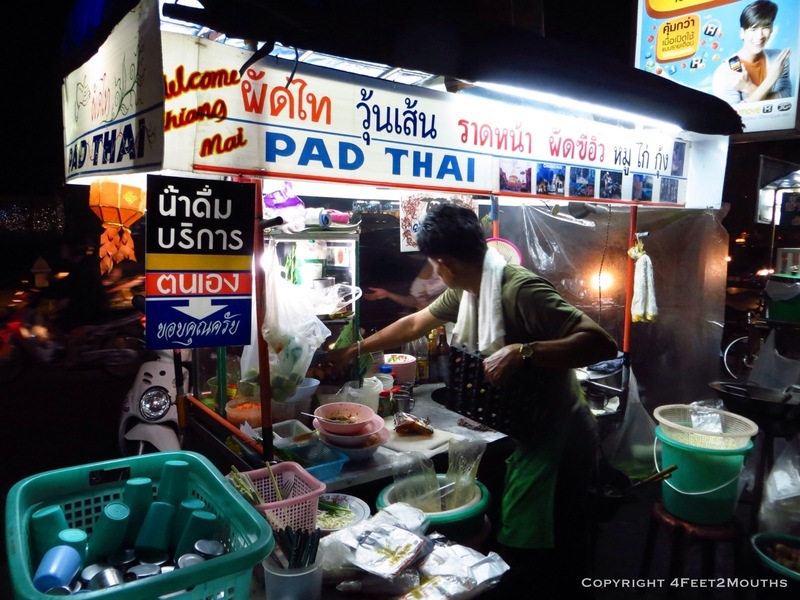 At the same market, look for the lone man towards the end pumping out pad thai. It was perfect. 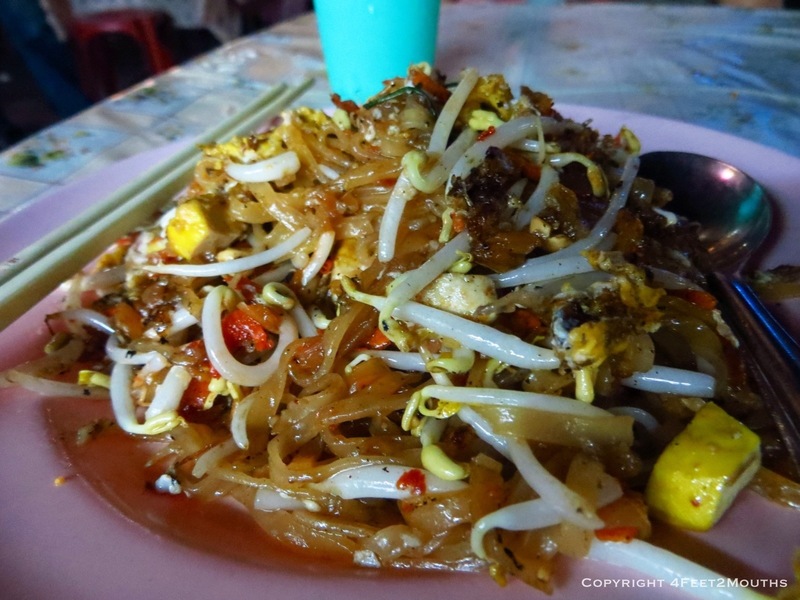 His pad Thai uses good tamarind paste so is more sour than the ones I’ve eaten in the States. The “original” mix he offered involved tofu, eggs, and dried shrimp. 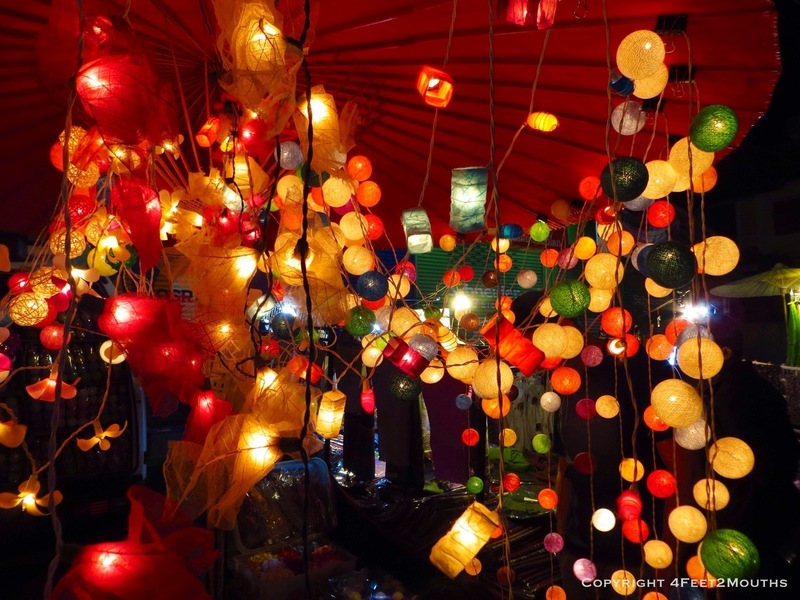 Many thanks to Mark at the Travelfish Thailand blog for pointing out this market! 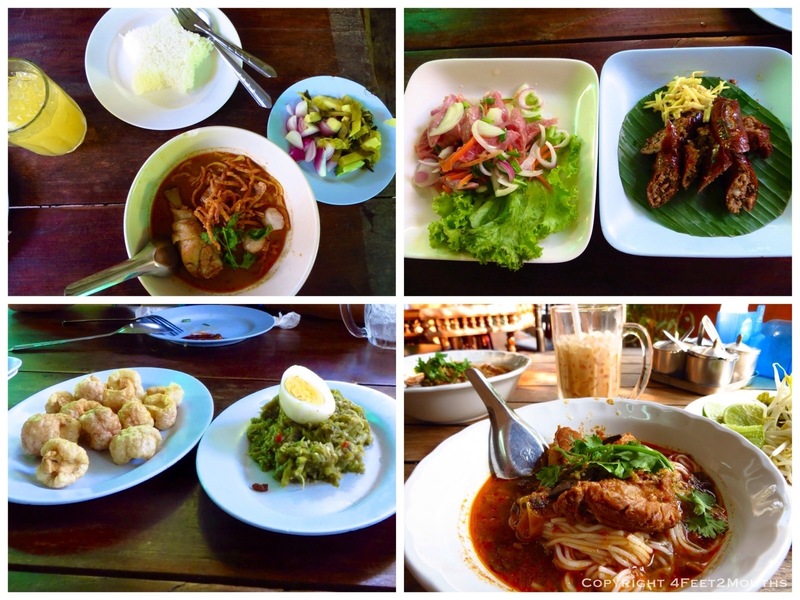 We were not in Chiang Mai for food alone. 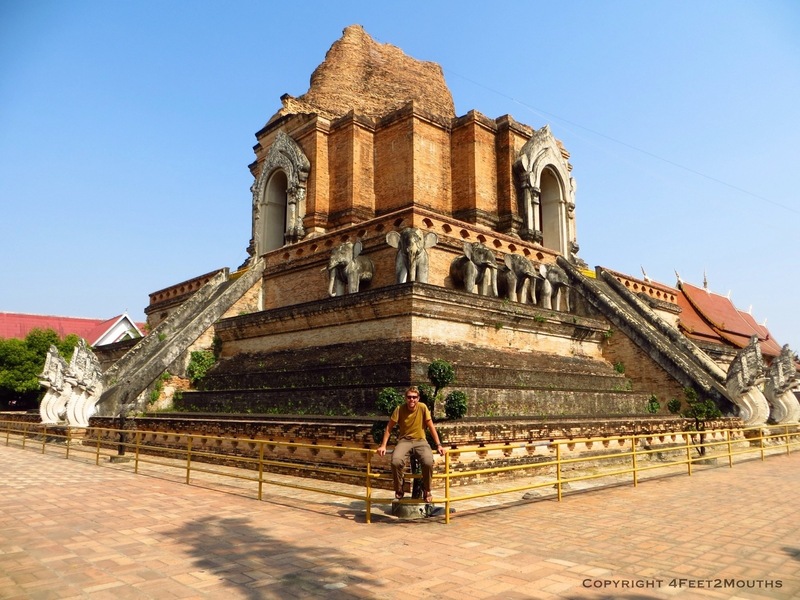 As the capital of the Lanna kingdom for centuries, Chiang Mai was also a spiritual center leaving a legacy of wats. Every street seems to have two or three. 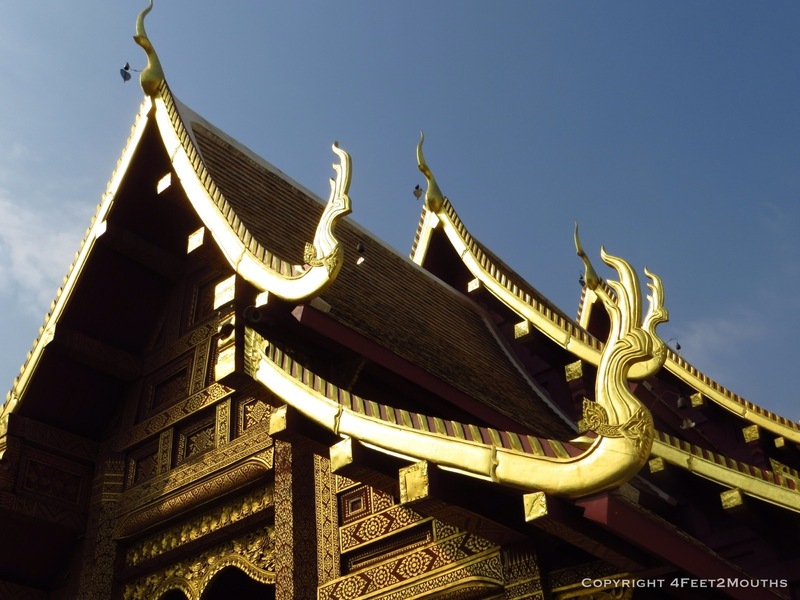 Some are more famous than others, such as the dark teak wood Wat Phan Tao. But all of them have a beauty to them. We really enjoyed Wat Monthian, on the northern border of the old town. 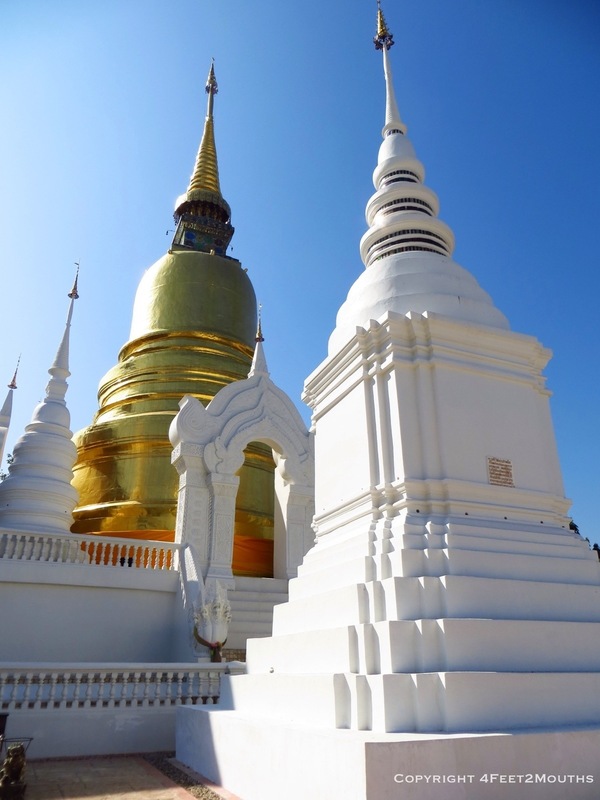 Another one of the well known wats is Chedi Luang. 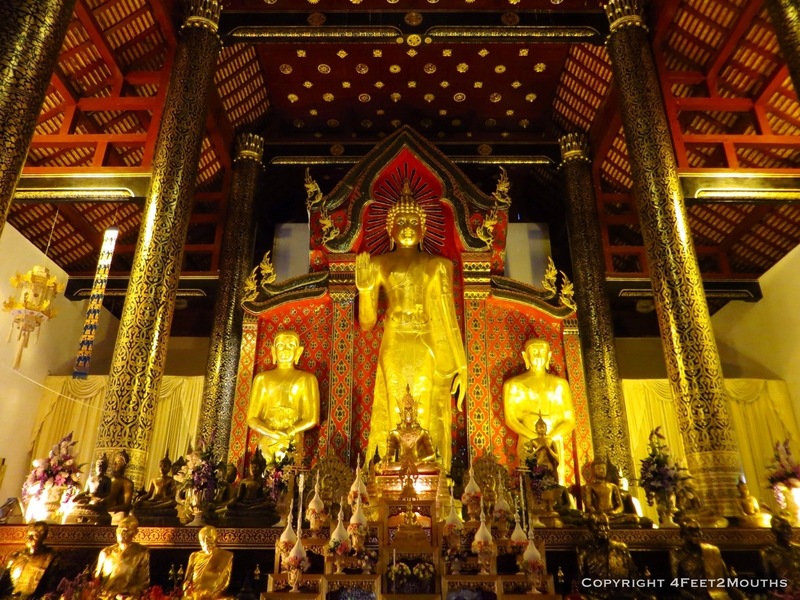 It’s large golden Buddha had a string attached to his finger that wound its way around the temple interior. 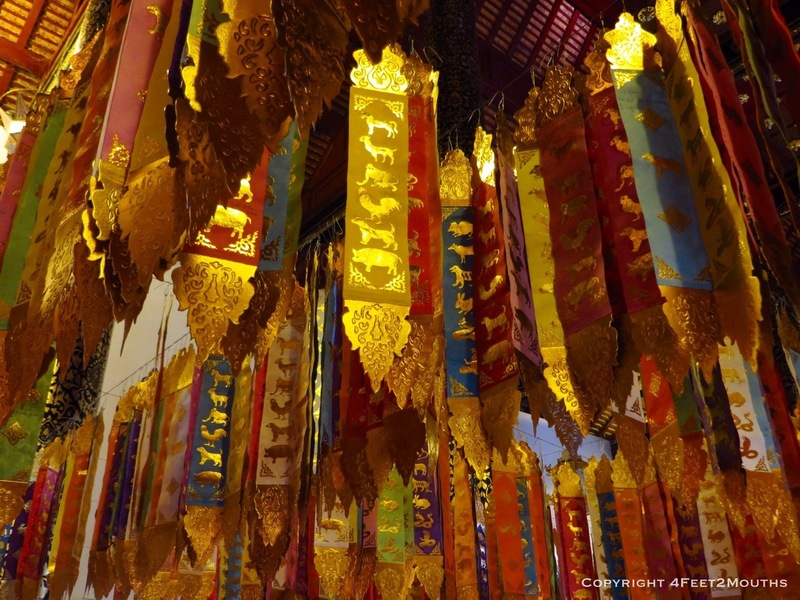 From the string, people hung flags with images from the Chinese zodiac. It was a peaceful place to kneel below the flags, on the thick carpet, and quietly observing people coming into pray. Afterwards, we went to the back of the wat to see the oldest chedi (sacred site usually in a mound or pyramid shape) in Chiang Mai. The next day was an important one. It was Nathan’s turn to celebrate his birthday! So what does one do in Chiang Mai to celebrate? Take a bike ride to a nearby wat of course. But wait! 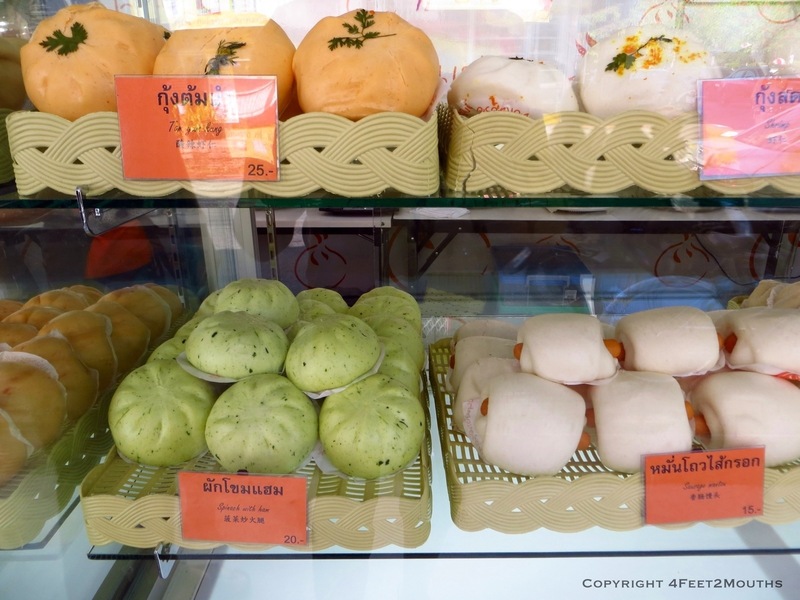 On the way we spied a shop selling a variety of colorful steamed buns. I’m used to these being filled by Chinese style pork or red bean paste, but these were different. There was everything from taro to spinach and cheese filled buns. We opted for pandanus and Thai pork buns. They were both good but the latter was revelatory! The lemongrass in the filling was so good and I was soon dreaming up ways to market these fusion bun treats. 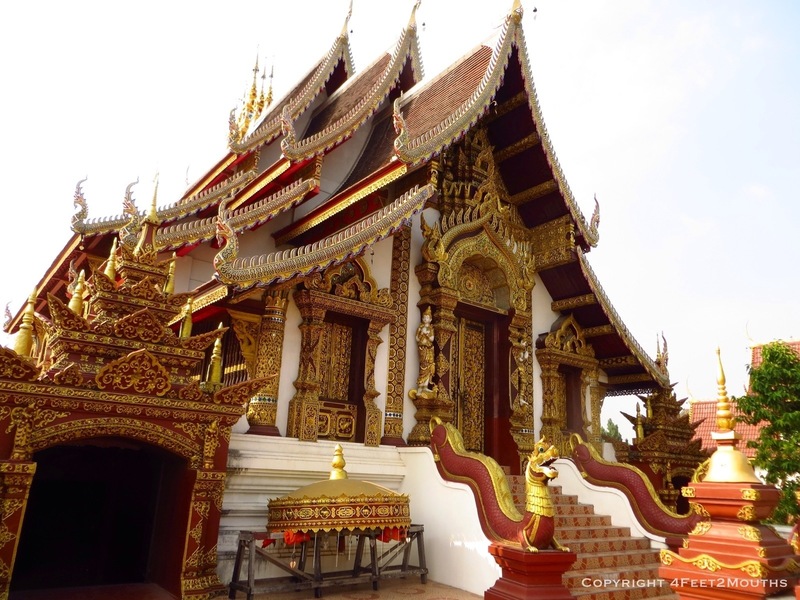 We did eventually make it to the Wat Suan Dok. It had a number of white chedis for some fun photos. To add a bit of surprise to Nathan’s birthday I researched a place for a good but laid back lunch. Huen Phen fit the bill and offered some great eats in casual surroundings. My favorite was the amazing Thai sausage. I had read about it online and I think it lived up to the hype. It was super tender and well spiced. Another great dish was the khao soi, a curry based soup complimented with pickled veggies to sprinkle in. We even came back the next day, when the little khanom jeen nam ngiaw place we had looked up ended up being closed. Huen Phen’s version lifted our spirits with its rich pork broth, which Nathan likened to Mexican posole. And then there was cake. Not far from our hostel was the Fern Forest Cafe. 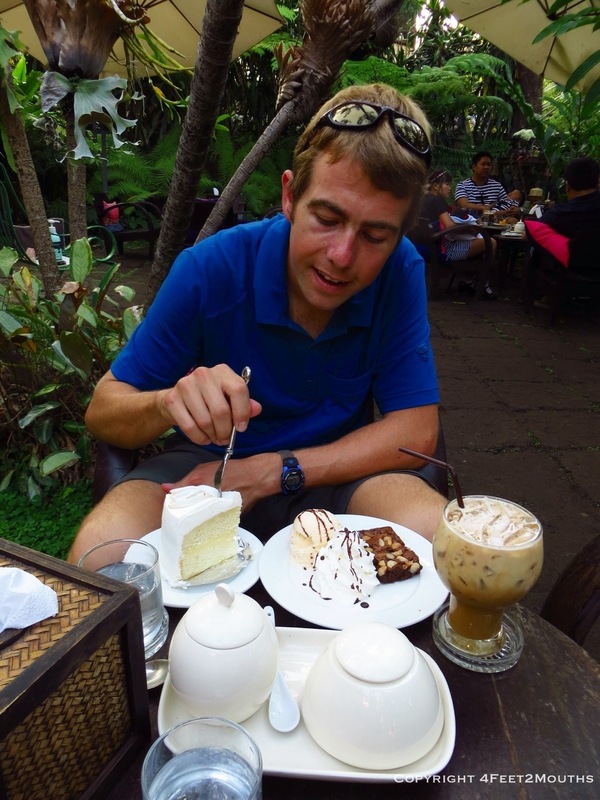 It turns out the Thai love their cakes so we had plenty to choose from. We opted for a coconut cake with fresh coconut strips lying on top and a brownie with ice cream. But when it’s your birthday, you can eat all the dessert you want. 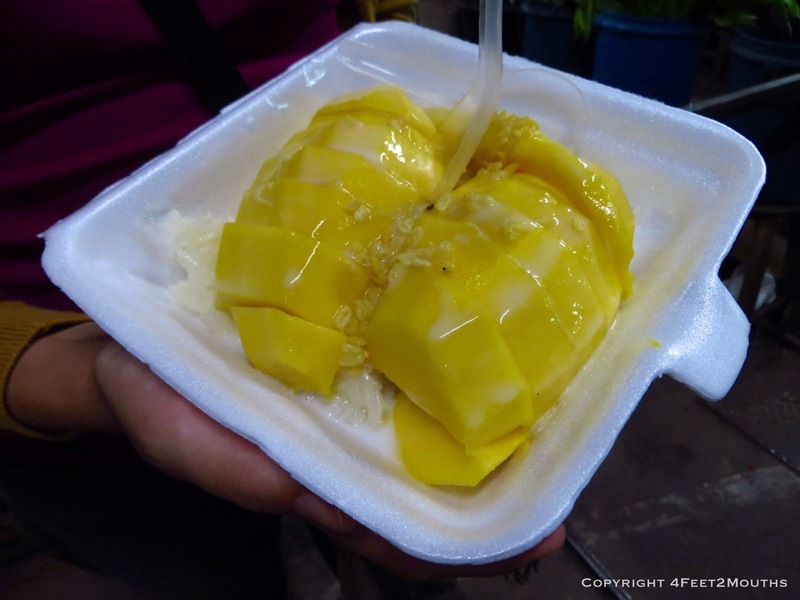 So that night we bought a final mango sticky rice at the Saturday market. Chiang Mai is particularly known for it’s Sunday market, so I was under the impression that the Saturday one would be rather small. I was completely wrong. It took us two hours to walk through the crowds while checking out the merchandise! Amazingly, there weren’t many vendors selling the same thing. The following morning Nathan went on a nice healthy run while I slept in (this is usually the way it goes). On his way back he noticed people fighting for tables at a nearby restaurant. That was all it took for us to make it our choice for breakfast. And it was a good one! 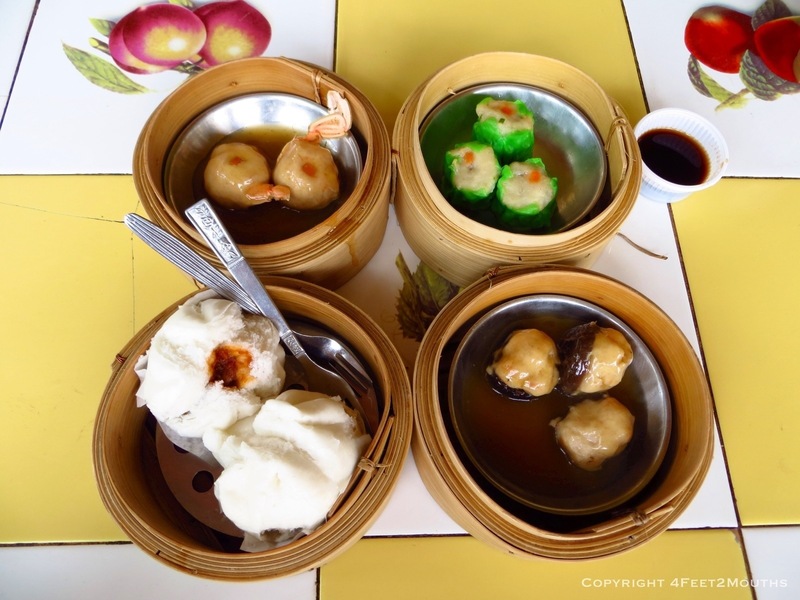 We enjoyed a variety of savory and delicious dumplings as well as some congee. Our last day was filled with visiting the city museum and then the mother of Chiang Mai’s markets – the Sunday Walking Street. We were prepared for this one because of our experience at the Saturday market. As expected it was huge and glorious with shoppers shuffling en masse down the main drag of the old town. After perusing the goods and soaking in the vibrant atmosphere it was time for us to catch a bus. Goodbye Chiang Mai, it was wonderful to meet you! Khao Kha Mu was fantastic in Chiang Mai. We just had one day in Bangkok, but it was not the same without you. We’ll have to visit Thailand together again in a couple years!